Yupo Ultra. A unique alternative to tradional papers. 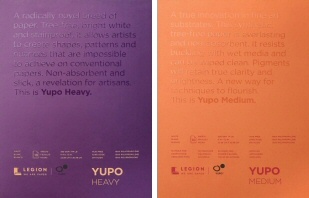 Yupo is a synthetic polypropylene paper made in the USA. 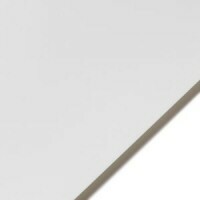 It is bright white, extremely smooth, non-porous, stain resistant and extremely strong and durable paper. The paper remains perfectly flat, eliminating the need for soaking, stretching, or taping. Pigments applied to the Bright White sheet display their true clarity and brilliance. Yupo is definitely different. You need to adapt your approach to it. Watercolour is extremely easy to lift off Yupo paper, to the extent that you can wipe the sheet completey clean if you wish. You can also rework areas over and over again and build up paint layers easily. To protect a finished work simply spray the painting with a matte or gloss varnish. Pads are available in either 200gsm or 390gsm. Each pad contains 15 sheets. Single sheets are available as 200gsm in 6 sizes.